Easy. Healthy. Paleo. Able to be made in a slow cooker. And, natch, the taste. Just a few things we adore about this chicken bone broth. 1. If the bones are raw, you can first brown them*, if desired, to increase the complexity of flavor of the resulting bone broth. To brown the bones, preheat the oven to 400°F (200°C), toss the chicken parts in a roasting pan, and slide them in the oven until richly browned, 30 to 60 minutes. 2. If using a stock pot, toss the bones in the pot. Add the water, salt, and vinegar, cover, and bring to a boil. Reduce the heat to a gentle simmer and cook, covered, for 12 to 24 hours, skimming any fat and film as it cooks. If necessary, add a little water to keep the bones submerged. If using a slow cooker, toss the bones in the pot. Add the water, salt, and vinegar, cover, and bring to a boil. Reduce the heat to low and cook, covered, for 24 to 48 hours, skimming any fat and film as it cooks. If necessary, add a little water to keep the bones submerged. 3. Strain out the bones and add salt to taste. If you prefer a darker, more robust flavor to your chicken stock and are using raw chicken, first brown it to draw out more complex flavors. You can do this in a deep-sided pot over medium heat with a little oil or in a roasting pan with a little oil and an oven that’s set to 350° to 400°F (180° to 200°C). 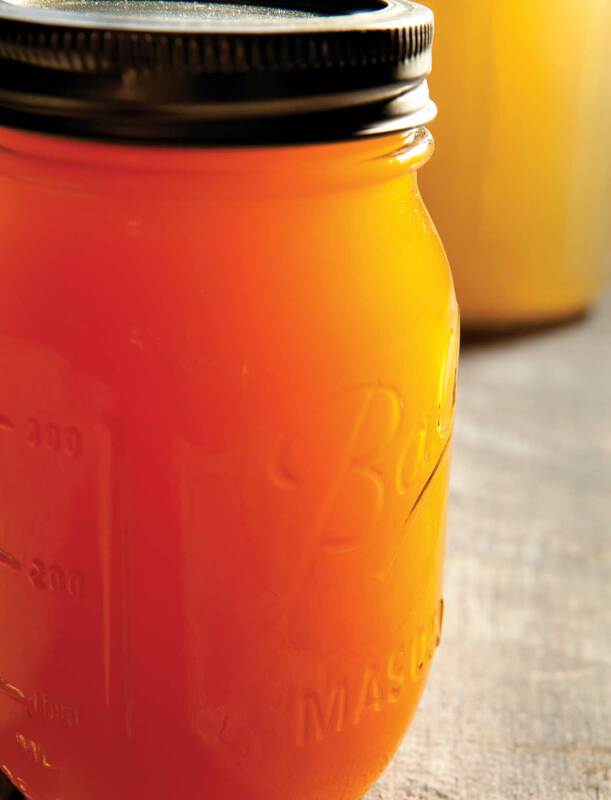 Chicken Bone Broth Recipe © 2015 Hollan Publishing Inc.. Photo © 2015 Allan Penn. All rights reserved. All recipes and photos used with permission of the publisher. This chicken bone broth recipe is a nice, simple way to make stock. With very minimal ingredients and effort, I was able to make a flavorful broth. I roasted the bones for 25 minutes at 400°F. I'm glad I did. I do think roasting enhances the color and flavor. I used my slow cooker on low for 48 hours and only needed to add 3 cups water. My yield was 2 quarts. This recipe is a very simple and cost-efficient way to make your own broth. Either save bones from your roasted chicken (collect the in the freezer until you have enough) or buy chicken backs (or chicken feet, if you are brave ) at your trustworthy butcher. You can even throw in a couple turkey necks or wings/drumsticks to make the broth even richer. The stock will become very stiff in the fridge and keeps about 1 week. I drink 1 or 2 cups broth every day. Makes you feel so much better! I roasted the chicken backs (not the feet!) at 425°F for about 1 hour, turning them once. I drained the fat and kept it. It's wonderful to fry in. I made the stock on the stovetop about 2 gallons at a time. I don't salt the stock but add salt later when I use it for cooking or drinking. Usually I never add vinegar but did this time, because it's what the recipe said. I didn't notice a big difference in taste or color. I let the stock simmer for 24 hours on the lowest setting, uncovered, so that only the occasional bubble appeared on the surface. I didn't add any water. The yield was about 90% of the water you add. After cooking, I think it's important to de-fat the broth and strain it through a fine-mesh sieve. Bone broth is very healthy for you, so I was excited to make this recipe. Finding the “off” cuts of chicken is becoming more difficult. Most stores don't carry them, and now many butchers don't, either. I used a combination of wings and thighs to make this broth. I roasted them in the oven at 400°F for 30 minutes. I chose to add the thyme to the pot, as there were no onions, garlic, or other ingredients for flavor. I allowed it to cook for 24 hours in an 8 1/2-quart slow cooker, as the volume of water was too much for my regular 6-quart slow-cooker. There was no need to add any additional water while cooking. After straining this recipe yielded 18 1/4 cups (4 1/4 liters) broth. The resulting broth is much lighter than I am used to making, but I'd attribute that to the large volume of water. Also, it didn't gel after being refrigerated overnight. Because of the roasting there was little fat to skim off. I've used this in a stir fry and a couple light soups so far. My husband had a cup of just the broth with his lunch once or twice. As is, the recipe makes a perfectly acceptable light broth. I'm not sure if another day's cooking would have made any difference to the final broth or not. I usually like to add a couple aromatics for flavor, like onion, garlic, and bay leaves, and I think I missed the addition of those. I did like the amount of broth that this made. As a possible explanation for Helen Doberstein whose stock is described as “light” and didn’t “gel” under refrigeration, it’s probably because you didn’t use the backs and necks called for in the recipe. You need lots of bones to produce good, flavorful stock that becomes gelatinous when cold. Thighs just won’t give you the same result. Now a question. Do you recommend pulling the skin off the bones, the necks, in particular, before roasting? Does it matter? Many thanks. Thanks, Irene. I’m going to jump in and respond to your question. I don’t believe I’ve ever been given chicken necks with the skin still attached, but if you encounter this, yes, I would remove the skin from the necks and any other chicken parts prior to roasting. Fat is essential in stock but roasting the fat degrades the fat which could affect the taste, nutrition, and color of the resulting stock. into the crockpot – and put on high – letting it simmer for 24 hours. Remove broth. Add more water 2- 3 times. 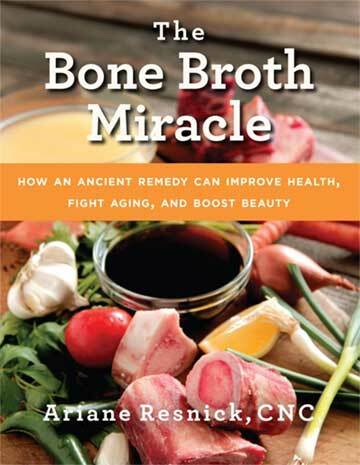 Sonja, I’ve been researching and making bone broth stock for years, and I, too, have found conflicting information about the fat. I don’t think there’s a wrong way to make stock per se. In response to your question about fat, I’m also a holistic health coach and I can vouch for the fact that it’s true that toxins are stored in fat. But fat also helps the body absorb the nutrients in the broth so you don’t want to eliminate it completely. What I would pay attention to more than the amount of fat is the type of fat. What I mean is if you can, opt for an organic hen so that you’re assured it wasn’t fed GMOs or animal byproducts or antibiotics or pesticide-laced chicken feed. This greatly reduces the toxins in the fat. As far as whether or not to include the skin and fat, when I make stock from the roasted carcass of a hen, I use only the bones and scraps of meat. I don’t use the skin because it’s my understanding that heating fat to higher temps promotes free radical activity and rancidity. When I make stock from raw bones and skin, I use all of the skin and fat. While the broth gently simmers, I skim any scum from the surface but I allow the fat to pool on the surface and remain there until after the stock is done cooking. Then when the stock is done I allow it to cool and I remove the fat from where it’s floating atop the broth. It’s a complicated issue, as you say. I hope this helps.